Make something beautiful. Make something better. The Multimedia Program at Del Oro embraces the convergence technology, design, innovation, art, entertainment, and entrepreneurship. Multimedia students will learn and practice design thinking as they use building blocks like videos, images, motion graphics, text, programming, music and voice to create various projects. Frosh Tech – Students will master the foundation standards by which computer software technologies are utilized in the Placer Union High School District as well as in colleges and careers. Students will learn computer basics (hardware/software), industry standard core applications (Google Mail, Drive, Sheets, Slides, Docs), Adobe CS6 (i.e. Photoshop, Premiere), and various web-based applications (aka: Web 2.0). Students will be guided according to California State Career and Technical Education (CTE) Standards (see www.cde.ca.gov) through thematic project-based lessons. that reflect interests, pathways and post secondary options. Frosh Tech, he/she needs to enroll in Video Production. The course provides students with a basic understanding of the technology behind video as an information medium and some of the ways in which it is created to achieve its desired effect on an audience. Students are given instruction on equipment/ software operation and ongoing guidance as class projects progress. 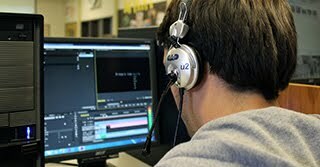 Upon completion, students should be able to demonstrate production skills and techniques allowing them to produce video for a variety of audiences. Example projects include producing public service announcements, music videos, news stories, and promotional commercials. campus events. Daily tasks can involve being an anchor, running the video switcher, operating the teleprompter, or controlling the soundboard. Each week students create short videos that highlight events that happen at school or in the community. Work created here will be posted and updated on deloronews.com and the Del Oro News YouTube channel. This is a project based introduction to web design and development that will cover the fundamental concepts needed to build and maintain web pages using Hypertext Markup Language and Cascading Style Sheets. Students will evaluate existing websites to learn the best practices in the world of web design. Students will explore various elements of website layout, navigation, and design. The course will progress from introductory work with web concepts to a culminating project in which students design and develop websites. D.O.T.S. is a student–run technology organization that provides technical services to DOHS staff and students. Students provide assistance in the areas of technical support, website design and management, as well as training staff on basic and advanced use of hardware and software. This course is designed to give students a realistic introduction to programming. Students will be able to design, write, and debug a high level program using the Visual Basic programming language. Emphasis is on structured design, object orientation, Graphical user interface design, and event-driven applications. Good code practices such as commenting, indentation and meaningful variable names are also stressed.